Whew! Right on the heels of a birthday weekend (which means lots of eating in restaurants) came a ten-day road trip to northern California – a whirlwind of a time which comprised a wedding, a funeral, plenty of family time, a couple of days and dinner dates with good friends, and a couple of vacation days. The ocean was played in, wine was purchased, nostalgic locations were visited, but mostly, (surprise!) food was eaten. To the literary nazis reading this: I intentionally chose the passive voice right there, and don’t regret it. One of my favorite restaurant meals was lunch at Citrus Club in the Haight-Ashbury district of San Francisco, right by Golden Gate Park. It’s a noodle house that uses citrus-based sauces instead of oils. If you go, get the garlic noodles and ginger chicken with a cold sake. The best dinner out was at Lotus Chaat, a primarily vegetarian, southern Indian restaurant and spice market in the Marin town of San Rafael. The food at Lotus Chaat is plentiful and spiced to your liking, and the service is unbeatable. If you’ve never before eaten a dosa, get thee to your nearest southern Indian dining establishment and make sure you’re hungry. Always a foodie go-to is Napa and its surrounding towns. When we’re in the area, Joe and I never miss Oxbow Market, popular among locals and tourists alike for obscure spices, the freshest of produce, hand-crafted bitters, oysters, artisan cheese, Italian pastries, etc. Oxbow is also home to Ritual Coffee Roasters (Joe’s favorite), Three Twins Ice Cream (my favorite – oh, the lemon cookie! ), and Gott’s Roadside (our favorite as a collective). Gott’s is a diner on crack. You’ll pay a little more than you would at your average diner, but you won’t regret it – especially if you order the garlic fries. It’s all local and made with love, and you can’t really put a price on the love. Except you can. $30-40 for two people to get crazy full. Easily the best meal on our trip was one cooked by our wonderful friends, Tanner and Heather. We always eat really well with T & H; they cook beautifully, creatively, and simply. They appreciate nuance in flavor and a good bottle of wine, and that’s only the smallest of reasons I love our friendship. Our Monday night meal was a feast of grilled lamb pops, grilled flatbread, caprese salad from their garden, basil and mint pesto from their garden, and fig-serrano compote with peppers and herbs from their garden and figs from Joe’s grandma’s tree. Tanner was the brains and the brawn behind the compote, while the rest of us tasted and stirred and recommended small additions. It was delightful. The whole evening was delightful. There’s just nothing like sharing a meal with good people. 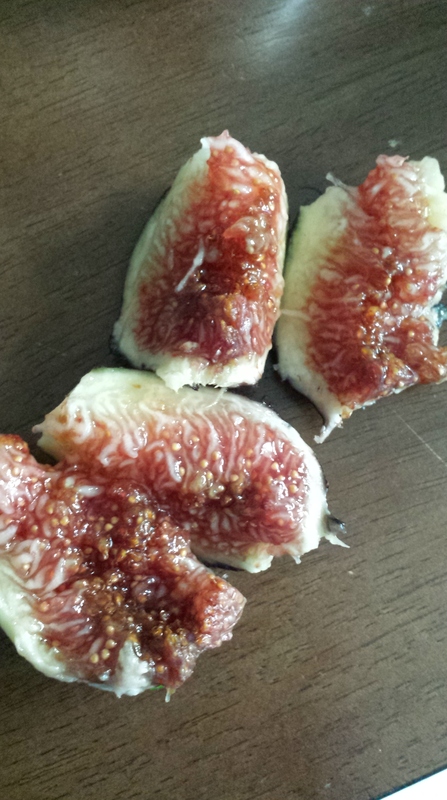 We carted home about twelve pounds of figs from the aforementioned tree, and last night recreated the fig compote with a couple of adaptations, mostly due to memory problems. It still came out nice and tasty, and I canned seven half-pint jars to save for meals down the road and/or stocking stuffers. Join me in this sweet and savory party, why don’t you? To make the compote, begin by rinsing about six pounds of figs, cutting off their tops and bottoms to remove some of the white parts, and slicing them into a medium-sized saucepan. There’s no need to be super methodical or concerned with size; they’ll cook down and you’ll blend them up. Mince five to seven serrano peppers, seeds and all, and throw them in with the sliced figs. 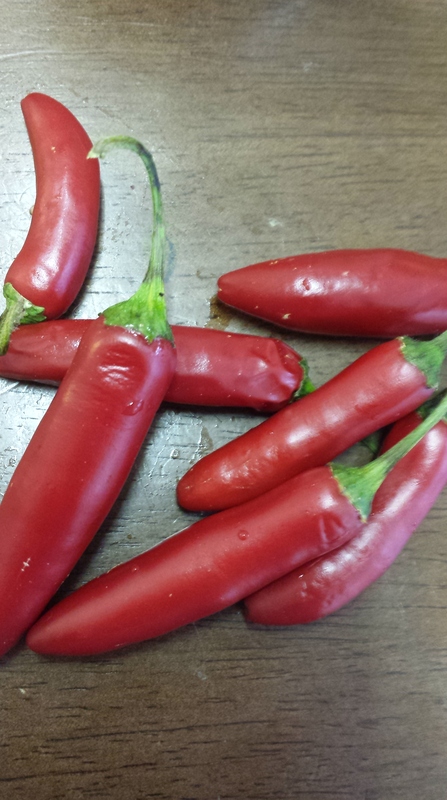 Don’t worry; they aren’t that spicy. I even had to throw in some red chili flakes to bring the heat to my liking. Mix in a half cup of sucanat or brown sugar, and heat the saucepan to just over medium, or whatever it takes to get a mild bubble happening. 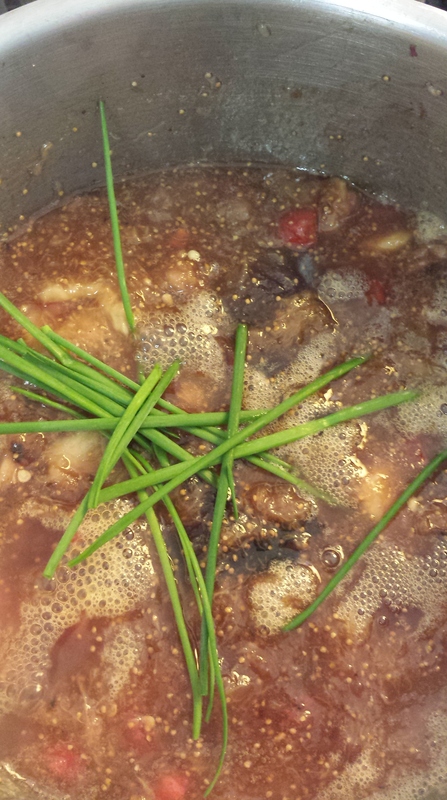 Once it bubbles, reduce the heat to a simmer and add a handful of chives and about a tablespoon of fresh thyme. Pour in a small glug of apple cider vinegar. I used about 2 1/2 tablespoons, but you can use more or less depending on your desired level of brightness. I thought the amount I used contributed a happy level of acidity without making the sauce taste at all vinegar-like. This picture isn’t super pretty, but you can count on it tasting just right. 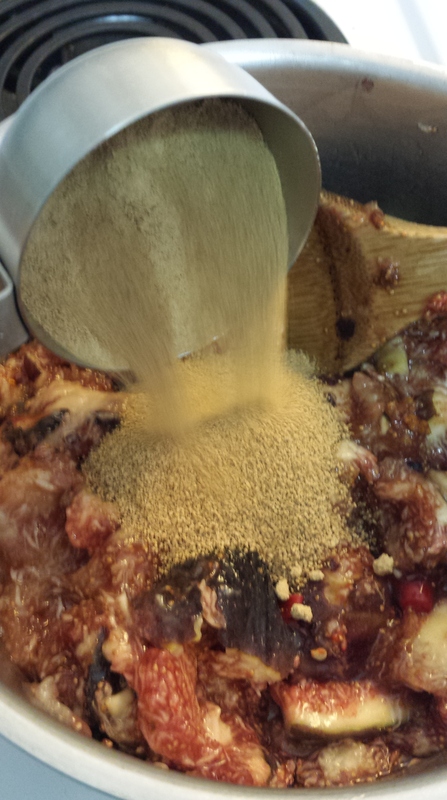 Let the compote simmer until it’s reached the consistency you like. Pureeing it with an immersion blender really melds the flavors together nicely. Dip about 3/4 C of the compote into seven sterilized, half-pint mason jars. With sterilized lids on, boil them in a hot water bath for 10 minutes. Wait until the seals pop, then they will store for many moons. Alternatively, you can freeze the stuff. It is fabulous as a pizza sauce with arugula and goat cheese and pancetta (what else?). It’s great with grilled or roasted meat. It’s enjoyable over veggies or as a dip. 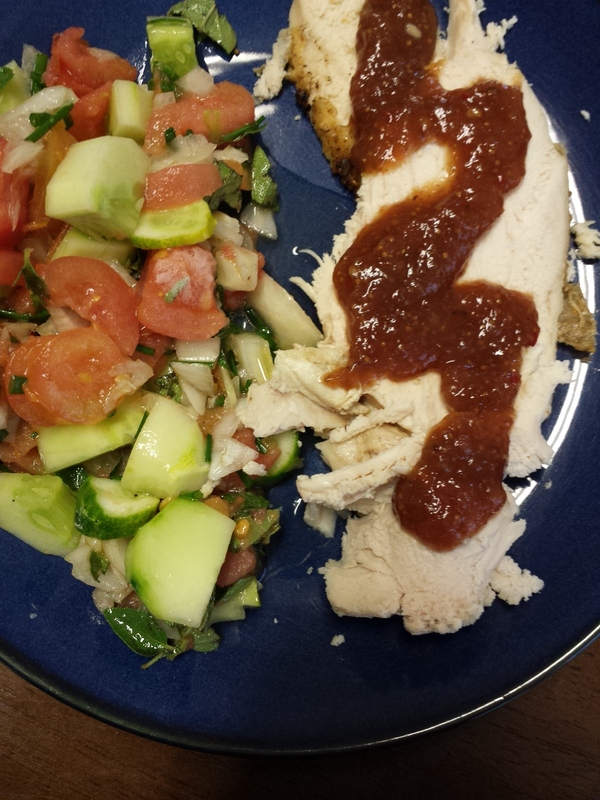 I served it last night over roasted chicken with a salad entirely from the garden (cucumber, tomato, shallot, parsley, oregano) dressed with olive oil and lemon juice. Begin by rinsing about six pounds of figs, cutting off their tops and bottoms to remove some of the white parts, and slicing them into a medium-sized saucepan. Mince five to seven serrano peppers, seeds and all, and throw them in with the sliced figs. Mix in a half cup of sucanat or brown sugar, and heat the saucepan to just over medium, or whatever it takes to get a mild bubble happening. Reduce the heat to a simmer and add a handful of chives and about a tablespoon of fresh thyme. Pour in the apple cider vinegar. Add more spice, if you are so inclined. 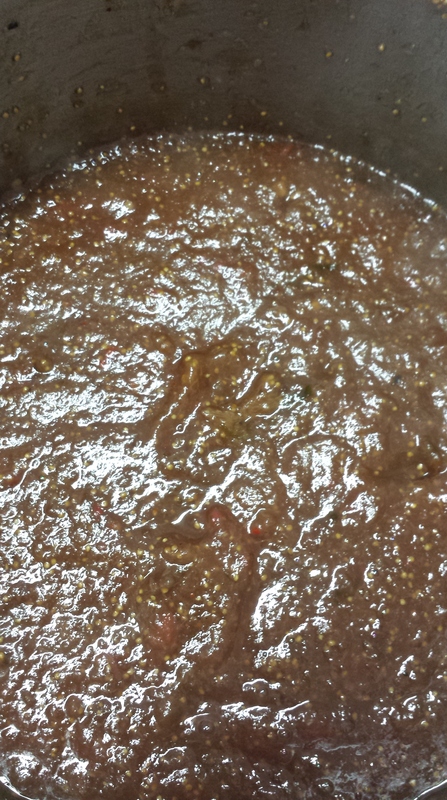 Let the compote simmer until it’s reached the consistency you like. Zizz it up with an immersion blender for a smooth, integrated texture and flavor. Dip about 3/4 C of the compote into seven sterilized, half-pint mason jars. With sterilized lids on, boil them in a hot water bath for 10 minutes. Store them when they seal. Refrigerate any unsealed jars. Alternatively, freeze it all in batches. 29 Jul	This entry was published on July 29, 2014 at 6:46 pm and is filed under Collection. Bookmark the permalink. Follow any comments here with the RSS feed for this post.